January 8, 2008, between 7 PM and 7:30 PM Central, hovering over Erath County Courthouse, Stephenville, Texas. Graphic illustration produced from eyewitness testimony of three Erath County police officers. Provided to Earthfiles by officer Greg. Red star marks position of Erath County Courthouse at 100 W. Washington Street in Stephenville, Texas. Erath County, Texas, was established January 25, 1856. 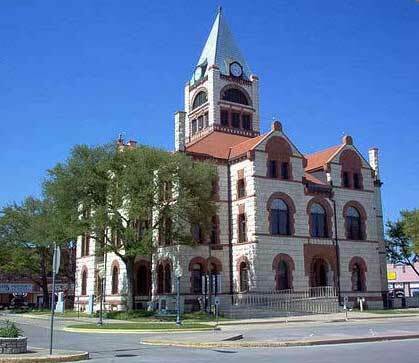 The county seat is Stephenville and the Erath County Courthouse above was completed in 1893. Image courtesy TXGenWebProject. December 17, 2008 Stephenville, Texas - Almost one year ago, at the end of January 2008, I flew to Texas to talk with eyewitnesses and see videotapes, photos and sketches of the many unidentified aerial craft sightings reported that month over Stephenville, Dublin, Selden, Glen Rose and surrounding region. That group of rural towns is southwest of Dallas/Fort Worth. One eyewitness in January was Lee Roy Gaitan, Erath County Constable for Precinct 2, officed in Dublin, a town of about 4,000 people only eight miles southwest of Stephenville. 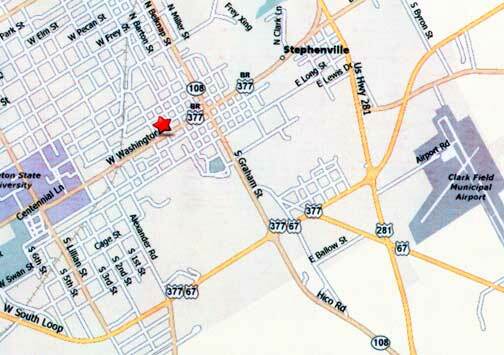 Stephenville is the larger Erath County seat with about 15,000 residents.